Can logic tell us stuff about God? [audio:http://www.truthrevolution.tv/show/TS-0314.mp3]No Flash Support? Use this Audio Player! Dave: Can we use logic to actually know anything about God himself? Jeff: Does anyone see a problem with that statement? Dave: You should have problem with it! Listen to it again. Dave: It’s a logical statement about God! Jeff: Right. 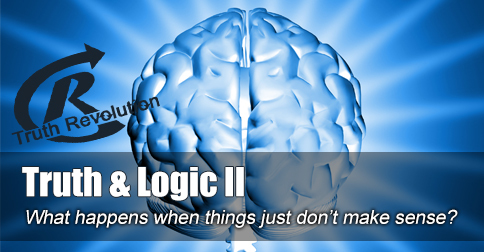 The first assumption of saying, “Logic cannot” is that it’s true, and the opposite is false. Dave: That is known as the law of non-contradiction and is the crutch upon which all logic rests! Jeff: Therefore, this statement is a statement of logic itself, demonstrating that logic leads us to truth. Jeff: …you have to use logic to do it.